This is what life with childhood cancer is really like. Ella has been through more health struggles than most will face in a lifetime. Eight-year-old Ella loves all things arty and crafty. Frozen, Minecraft, playing (and sometimes getting into mischief) with her friends, snuggles with her pet cat Andy, and dancing up a storm. Does this basically sum up every little eight year old girl you know? But while Ella may seem perfectly ordinary from the outside, she has been through more in her eight years than most people will go through in a lifetime. Ella has spent a great deal of her short life in and out of hospital, battling Acute Lymphoblastic Leukaemia (ALL). ALL is a rare disease, representing only 0.3 per cent of all cancers diagnosed. However, it is the most common form of childhood cancer. Ella was first diagnosed with ALL on the 2nd of September, 2009. She was not even two years old. At that moment her mum, Kerryn, felt as though the world was against her. Only nine months earlier Kerryn had lost her husband Mark, Ella’s dad, to a rare form of brain cancer and was facing life as a single parent and battling to keep herself and Ella afloat financially amid a whirlwind of grief. It’s difficult to even imagine what Kerryn was going through. Cancer had taken her husband, and now it wanted to take her little girl too. Image via Facebook @Ella&apos;s Journey. After just over two years of intensive chemotherapy treatment, Ella went into successful remission. Just think: by this point, Ella had spent more than half of her life receiving treatment for cancer. This joyful news was not to last, however, and after 13 months off treatment, Kerryn received the phone call that all parents of children with cancer dread: Ella had relapsed. As if it wasn’t bad enough that the cancer had returned, Ella and Kerryn had to leave their home in Hobart. They had to take up residence in Melbourne at the Royal Children’s Hospital, as Hobart just wasn’t equipped to provide the care and support that Ella would require throughout another marathon of cancer treatment. After getting the news of Ella’s relapse, Kerryn started a Facebook page to document Ella’s journey through her battle against “the beast”, as Kerryn calls it. The Ella’s Journey Facebook page has over 4,000 followers. They are a community of people who have come to love Ella without ever meeting her, and a community which provides support to Ella and Kerryn in any way it can, from monetary donations, fundraisers, gifts sent to Ella from all over Australia, and of course countless messages of support and hope. Over the more than two years following Ella’s relapse, followers of the page were kept updated with the highs and lows of her various treatments. They cried right alongside Kerryn as she watched her little girl suffer in ways no child should, and cheered with her when the news was good. Following Ella’s journey, we were given a rare glimpse into the day to day life of a family fighting childhood cancer. 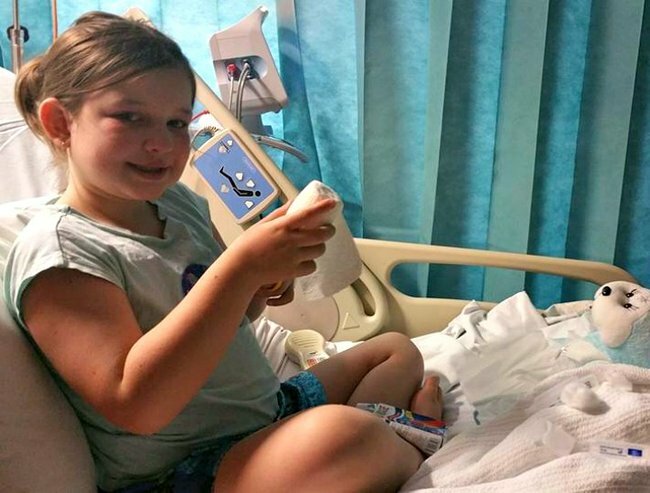 It’s easy to gloss over it all, and talk about the bravery of children like Ella. However, the reality is very harsh. During treatment, Ella has to remain mostly isolated, as her immunity is too depleted to be able to risk picking up an infection. Her skin is ultra-sensitive to sunlight, so even on the occasion doctors allow her to go outside, she needs to be covered up completely from head to toe. The steroids she needs to take cause her to become extremely irritable and lash out, and also gives her an insatiable hunger. At points during her chemo treatment, Ella was in agony due to mouth ulcers, a side effect of the chemo itself. And of course, there is the hair loss, which can be very distressing to a little girl. On the 27th of April this year, Ella took her last dose of oral chemotherapy, and the results of a bone marrows biopsy came back on the 5th of May to say that there were no signs of residual disease. In August, surgeons removed Ella’s port which was used to administer treatment and take blood. Everything was going well, until a few weeks ago when Ella began suffering headaches, a stiff neck, blurred vision, and nausea. It was assumed she had contracted a virus, until a visit to the optometrist revealed swollen optic nerves in both eyes. Tests were set into motion, and a lumbar puncture brought about that once again devastating revelation: Ella has once again relapsed. Within hours Ella, Kerryn, and her husband Ian (Kerryn remarried in 2014) were on a flight to Melbourne, where they now wait for the next phase of treatment. At the moment the top priority is to reduce the pressure in Ella’s eyes in order to preserve her sight. It is apparent that this time around, Ella is going to need a bone marrow transplant. Before this can happen, she needs to get back into remission. However, Ella has no brothers or sisters, her father passed away when she was a baby, and Kerryn is not a tissue match. Her best hope of finding a donor is through the Bone Marrow Donor Registry, and this is where you may be able to help. Visit the Australian Bone Marrow Donor Registry website to find out how (they have a list of eligibility criteria on the site). Getting tested is as simple as donating blood, and you could save the life of someone like Ella. It is no doubt a long road that lies ahead, not only for Ella, but for the whole family. Even when Ella has been in remission, Kerryn deals with a constant, pervasive anxiety and fear of the unknown. Every ache, every fever, no matter how benign they may seem to the average parent, is a possible indicator that the cancer has returned. For parents of children with cancer, this anxiety never goes away. Now that Ella is older, bigger, stronger, and more aware of what is happening, Kerryn worries that the treatment will be more difficult than previously, when she was just able to hold her little girl while treatments were administered. While Ella, Kerryn, and Ian are together as a family in Melbourne for the moment, it is likely that Ian will soon need to return to Hobart to work in order to keep the family afloat financially. Kerryn has left her work to care for Ella, so finances will already be stretched. A friend of the family has set up a GoFundMe account, and while Kerryn and Ian don’t want anyone to feel obliged to donate, they greatly appreciate anything that comes their way. At a time like this, the last thing a parent should have to worry about is money. If you are able to contribute, you can do so here. Post you messages of support for Ella below. With one in 500 Australian children being diagnosed with cancer before the age of 15, it is high time children’s cancer is given more coverage. For more information about childhood cancer, please visit The Kids’ Cancer Project.